Phoenix Business Solutions – Data Driven Business Solutions! Leveraging technology effectively is essential to business success, but often small and medium size enterprises (SME's) simply don't have the in-house resources to stay on top of our rapidly changing tech environment. Phoenix provides a wide range of technology solutions from data management to cloud implementation to web presence optimization at a cost that Calgary SME's can afford. And, our team brings a depth of knowledge and expertise that will keep your enterprise competitive with your larger cousins, allowing you to focus on running your business. Welcome to our site. 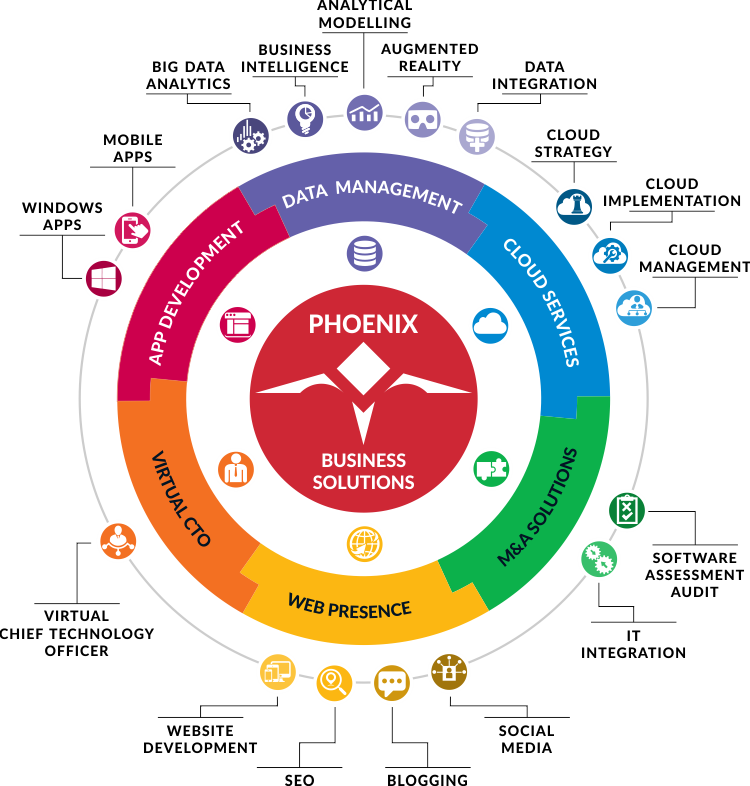 Here you will find detailed information on Phoenix' wide range of IT solutions. "Phoenix Business Solutions Inc. - IT Solutions That Work"
90% of all the data in the world was created in the last two years. Less than 1% of all data is ever analysed and used, leaving 99% of available data to be leveraged. 77% of companies use cloud computing, running at least part or all of their software and data services on the cloud. Percentage of business and technology decision-makers who have difficulty getting answers from their current dashboard metrics. Whether you have a project you would like us to quote, or just a question, we'd love to hear from you. Feel free to call us on our direct line, or fill in our contact form and we'll get back to you no later than the next business day.